Ok, I'll admit it. I bought this book purely on the cover and the name (does this say something about my being homesick for my old life...hmmm...more about that in another post.) 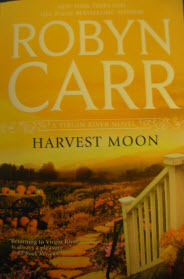 Harvest Moon by Robyn Carr is a story about a disillusioned chef who quits her stressful job and moves to the country to find herself again. Along the way, she gets to know her sister and meets someone who is carrying some baggage. The main character, Kelly, struggles with the decision on whether to take a chance on another relationship? While she slowly figures out what she wants from life she slowly begins to find love even though it comes with a little something extra. I really had a hard time getting past the grammatical errors. It bothers me so much when they don't correct those before the books get printed. However, the story was believable and about a topic I love...food!